Despite its initial humble appearance, the Model T became the most influential car of the 20th century. Priced so that the average American could afford it, the Model T was sold from 1908 until 1927. Many also may know Henry Ford's Model T by its nickname, the "Tin Lizzie," but you may not know why the Model T is called the Tin Lizzie and how it got its nickname. In the early 1900s, car dealers would try to create publicity for their new automobiles by hosting car races. In 1922 a championship race was held in Pikes Peak, Colorado. Entered as one of the contestants was Noel Bullock and his Model T, named "Old Liz." Since Old Liz looked the worse for wear, as it was unpainted and lacked a hood, many spectators compared Old Liz to a tin can. By the start of the race, the car had the new nickname of "Tin Lizzie." But to everyone's surprise, Tin Lizzie won the race. Having beaten even the most expensive other cars available at the time, Tin Lizzie proved both the durability and speed of the Model T.
Tin Lizzie's surprise win was reported in newspapers across the country, leading to the use of the nickname "Tin Lizzie" for all Model T cars. The car also had a couple of other nicknames—"Leaping Lena" and "flivver"—but it was the Tin Lizzie moniker that stuck. 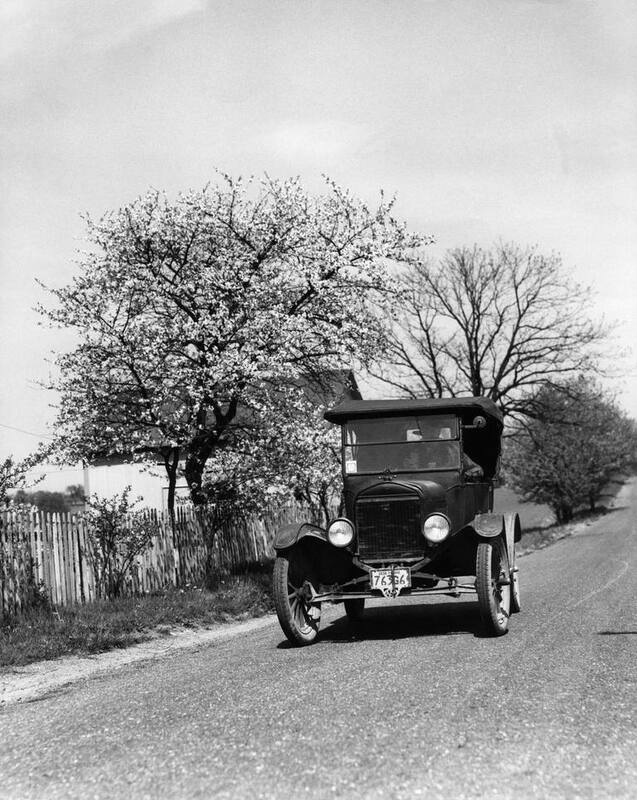 Henry Ford's Model T cars opened up the roads for the American middle class. The car was affordable because of Ford's simple but ingenious use of the assembly line, which increased productivity. Because of this increase in productivity, the price dropped from $850 in 1908 to less than $300 in 1925. The Model T was named the most influential car of the 20th century as it became a symbol of America's modernization. Ford built 15 million Model T cars between 1918 and 1927, representing as much as 40 percent of all car sales in the United States, depending on the year. Black is the color associated with the Tin Lizzie—and that was the only color available from 1913 to 1925—but initially, black was not available. Early buyers had a choice of gray, blue, green, or red. "Tin Lizzie" is still most associated with the Model T, but the term is used colloquially today to describe a small, cheap car that looks like it is in a beat-up condition. But keep in mind that looks can be deceiving. To "go the way of the Tin Lizzie" is a phrase that refers to something outdated that has been replaced by a newer and better product, or even a belief or behavior. Where Did Leicester City Get Their Nickname From? Why Are the Montreal Canadiens Called the Habs? Why Was Theresienstadt Considered the Model Ghetto? Why This 1993 Blizzard Is Called the "Storm of the Century"